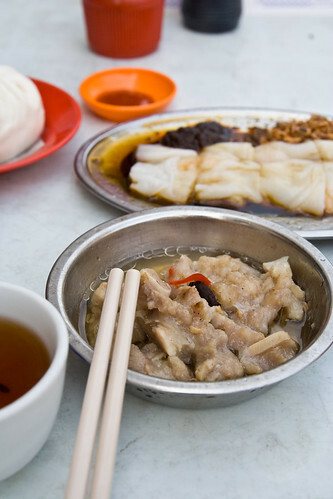 Barely 10 minutes into our walk towards Chulia Street, we came upon a bustling dim sum place. Because we have our priorities right, we dropped our bags beside the first empty table we could find and sat down to our first breakfast in Penang. An assortment of dim sum was quickly ordered. The Steamed Pork Ribs and Chee Cheong Fun were really good, especially when eaten with the chilli paste that came with it. If anyone’s curious, I recommend checking this place out, Leong Kee, at the corner of Lebuh Kimberley and Lebuh Cintra (closed by noon). 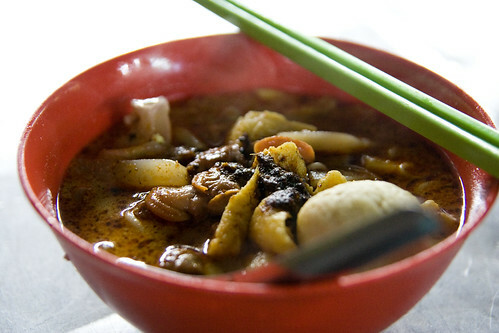 Still, if there was one dish that I had to remember Penang by, it was this… Penang Curry Mee. Unbelievably, we found the best rendition of Curry Mee just across the street from where we stayed. This was by far the best bowl of noodles I have ever had. We originally sat down for some wanton noodles but tipped off by the couple that shared our table, we decided to give Curry Mee a try. I had only one response after a spoonful of the broth. Wow. The broth was light but chockful of flavours. Complex and indescribably addictive. I spooned mouthfuls of the noodles down, one after another, and before I knew it, I found myself staring down an empty bowl. Just so I won’t forget, this Curry Mee stall is located on Chulia Street, near the intersection with Carnarvon Street. Look out for the huge Dunlopillo shop signage, the stall is just in front. Opens from 7pm, closed on Mondays. Check out the photoset here. Small Update: We settled on Crystal Guesthouse after checking out a couple options. A little pricier then the rest at RM50 per night, but the room was clean and came with AC and an attached bathroom. The room was somewhat musty with a small mosquito problem, but the AC helped and a couple of swats took care of the mosquitoes.